They are nature’s very own Death Star beams – ultra-powerful jets of energy that shoot out from the vicinity of black holes like deadly rays from the Star Wars super-weapon. Now a team of scientists led by the University of Southampton has moved a step closer to understanding these mysterious cosmic phenomena – known as relativistic jets – by measuring how quickly they ‘switch on’ and start shining brightly once they are launched. How these jets form is still a puzzle. 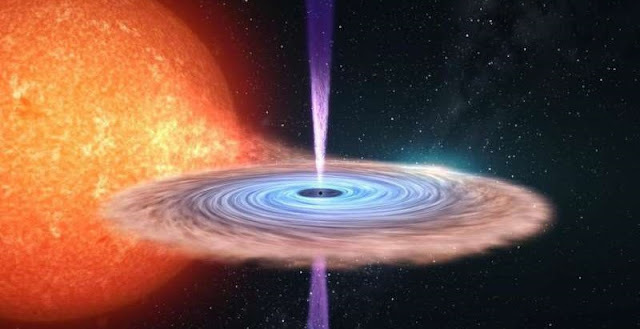 One theory suggests that they develop within the ‘accretion disc’ – the matter sucked into the orbit of a growing black hole. Extreme gravity within the disc twists and stretches magnetic fields, squeezing hot, magnetized disc material called plasma until it erupts in the form of oppositely directed magnetic pillars along the black hole’s rotational axis. In a new study published Monday, October 30 in Nature Astronomy, an international team of scientists led by Dr Poshak Gandhi show how they used precise multi-wavelength observations of a binary system called V404 Cygni – consisting of a star and a black hole closely orbiting each other, with the black hole feeding off matter from the star that falls through the disc – to throw light on this hotly debated phenomenon. “Now, for the first time, we have captured the time delay between the appearance of X-rays and the appearance of optical light in a stellar-mass black hole at the moment jet plasma is activated. This lays to rest the controversy regarding the origin of the optical flashes, and also gives us a critical distance over which jet plasma must have been strongly accelerated to speeds approaching that of light." The study also creates a link between V404 Cygni and supermassive black holes, which lie at the center of massive galaxies and which weigh billions of times more than stellar-mass black holes. Similar jet physics may apply to all black holes.